Between 2008 and 2015, thousands of Quebecers have been unfairly billed $ 1.4 billions of dollars. This practice had been established by the liberal government of Jean Charest and perpetuated by the government of Philippe Couillard. The energy critic for the CAQ, Chantal Soucy, strongly denounces this sneaky trick on the families of Quebec. For the residential customers, the overbilling represents about 587 millions. 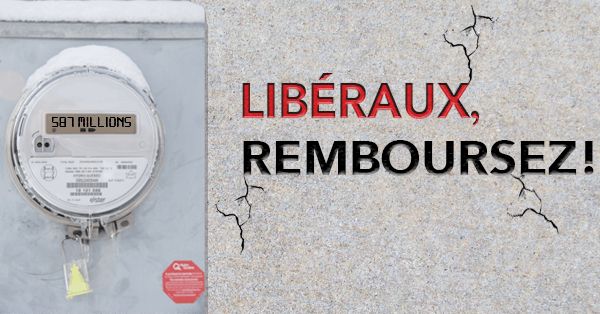 The campaign “Libéraux, remboursez!” of the CAQ is available here . Chantal Soucy invites all Quebecers and clients of Hydro‑Quebec to publicly denounce this overbilling and request a refund by the liberals.